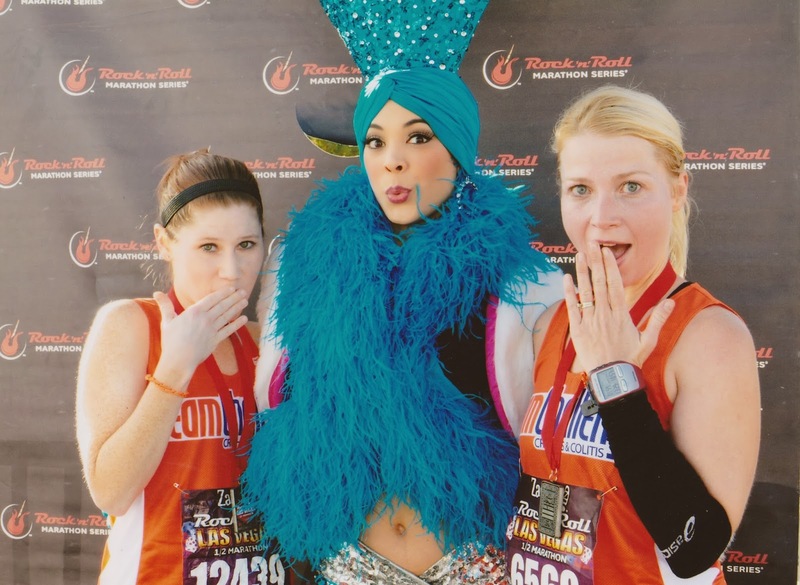 tracey's space: Vegas Race Recap! I am a little overwhelmed. How do I begin to put into words the events of this past weekend? I had the honor of traveling with Team Challenge Wisconsin to run in the Las Vegas Rock n Roll Half Marathon on Sunday. Not only was it a race with over 30,000 participants. but there were 1700 members of Team Challenge present from chapters all across the country who had collectively raised over 3.3 million dollars for the Crohn's and Colitis Foundation of America. It was kind of a big deal. I joined Team Challenge this cycle for a number of reasons. As I wrote in a previous post, I was inspired by the group I saw run the Napa to Sonoma Half Marathon in July. I had never fundraised on this scale before. I do a considerable amount of racing though so I figured it was about time that made that leap. Last, and quite honestly, I thought it would be a really fun trip to take with my friends. My running buddies who had been a part of Team Challenge during the previous cycle all told me that it wouldn't hit me the magnitude of what I was a part of until I was actually there. I don't have a personal story involving IBD. But every time I would read about other participants experiences in our weekly team emails I would think to myself, "Whoa. This is the right cause to be involved with." I can't imagine having to endure what some of my fellow team members have had to endure and the fact that they were training to run a half marathon in spite of it made be proud to be a part of such an amazing group of people. I've run half marathons and marathons before but because everyone around me was pushing themselves to new limits I felt that it was important to do the same. I set a very aggressive time goal for myself because I wanted to prove to everyone who had donated their hard earned money that this was not something I was doing "just for fun". As it said on my fundraising page: "I AM COMMITTED! I WILL DO IT!" My previous half marathon record was 1:51:07 so I told everyone I was shooting for not only a new PR but also to get under an hour and fifty minutes. Even if it was 1:49:59. I'm not gonna lie. I had a tough time out there. I paced myself poorly and had to work with every inch of my being to eek out those last few miles. I could sense my PR slipping away and it made me sad. But then I remembered a part of one of the speeches form the pasta dinner the night before that had really stuck in my head. He said something like "They don't' get to quit Crohn's. And you are not going to quit this race." So I sucked it up. Put all I had into those last miles and dove for the finish line. Needless to say I was beyond elated but I couldn't rest yet because I now had the job of cheering my other team members to the finish line. A few of us parked ourselves about a quarter mile from the finish and proceeded not only to cheer on our Team Wisconsin-ers, but every. single. person we could find sporting that orange tank top. As each runner or walker completed the race they joined our Team Wisconin pack and we brought home every last participant. And if you think that running for nearly two hours is difficult, try following that up with two hours of nonstop screeching and yelling. I confess I even got lightheaded at one point and needed to sit down and take a breather. Race cheerleading is hard! Aaaaannd then we partied to Bret Michaels at the post-race concert. Hello 1987! I would encourage anyone who's considering joining Team Challenge for the next cycle (in Napa!) to stop hesitating and throw their hat in the ring. You won't regret it. Even if you don't have a connection to Crohn's or colitis now, you'll soon realize what an important cause it is and how many awesome, inspiring people there are out there living with IBD every day. For me, Team Challenge was worth giving up sleeping in on Sunday mornings for a few months. It was worth all the worrying over meeting my fundraising goal. (I did.) And it was worth almost puking at the finish line. Because they don't get to quit Crohn's. And I was not going to quit either. If Team Challenge sounds like it's right up your alley, check out their website here or email Becky Burris for more information.